It is a given that portrait painting requires a likeness, but the true art is capturing the connection of human interaction. Portrait Society of America’s annual “The Art of the Portrait Conference” brings artists from around the world to celebrate the fine art of portrait painting for its 19th year in Atlanta, Georgia. The conference is a popular gathering for figurative and portrait artists to inspire each other, bring new opportunities to learn, and celebrate the love of art. Founded by FSU alumni Edward Jonas, the Portrait Society generously supports students with scholarships to attend. Using this opportunity to enhance the curriculum from Carrie Ann Baade’s Realism Workshop over a third of the class, some as scholarship winners and some as volunteers applied themselves to be part of this important opportunity. 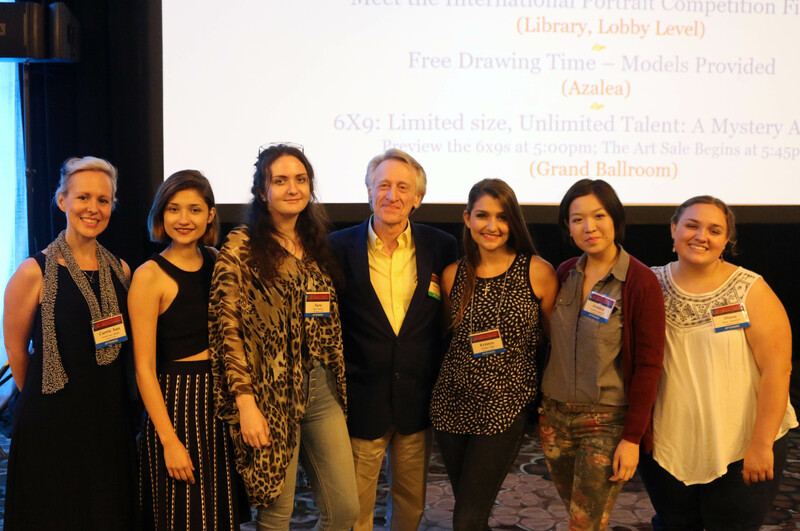 In conjunction, three students: Sara Caruso, Kristen Valle, and Jessica Nguyen were awarded an exclusive full-tuition scholarship waiver to attend the Portrait Society convention. These three students competed nationally with 120 other applications from ateliers and students based on their three sample paintings and written interest in the program. In addition to support from the Portrait Society of America, Kristen Valle and Jessica Nguyen were awarded the FSU Art’s Exceptional Opportunity Award which came as a generous gift from Ben Bivins and Elece Harrison to further to assist and guide these students in furthering their knowledge and artistic skills.